Good footballers are often described as ‘dangerous players’, but none more so than Alex Bruce who had a prosthetic hook on one arm, which made him very dangerous indeed! Less threatening was John ‘Specs’ Bennie who would use up to half a dozen pairs of spectacles during a game. Then there were players who had trouble with the law as the police were obliged to arrest young men who dared to play football on Sundays. 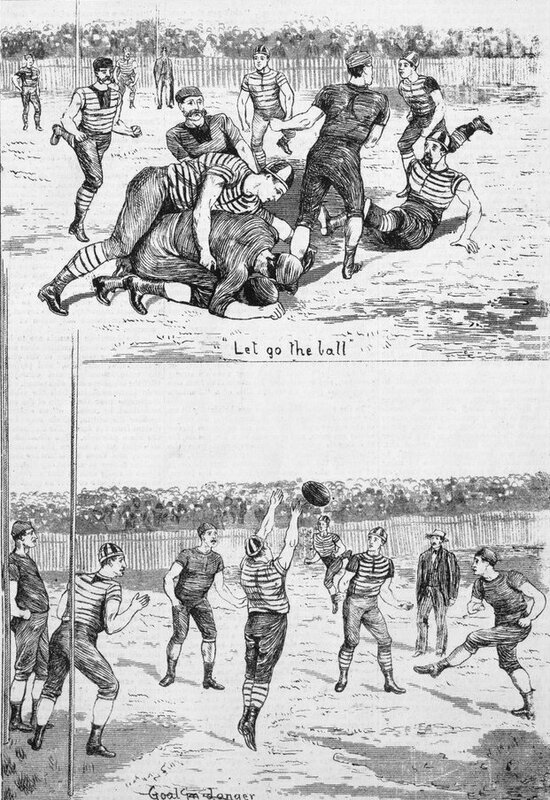 These are just a few of the anecdotes which enliven Mark Pennings’ exhaustive and fascinating record of the early days of Australian rules football in Victoria, Origins of Australian football; Victoria’s early history, volume 1, amateur heroes and the rise of clubs, 1858 to 1876. The author’s aim was to produce for 19th century football what Stephen Rodgers has so comprehensively done for the 20th century with his work Every game ever played. Pennings easily succeeds in this aim. Unlike general histories of the game by historians such as Blainey, Hess et al and Pascoe which provide an overall view, this is an encyclopaedic account of every season, and almost every match. 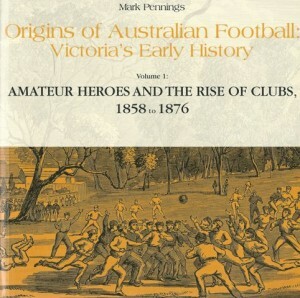 It even examines in detail the pre-history of football in Victoria before there were organised competitions. Pennings has meticulously checked and cross-checked thousands of newspaper reports to establish an accurate record of results, team lists, match reports, team captains, goal kickers, club colours and playing venues. There are three more volumes to come in this series which will cover the period from 1858 to 1896. 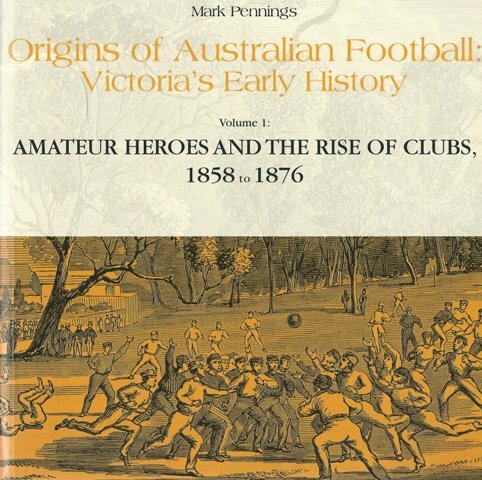 It will undoubtedly become the essential reference work for the early history of footy in Victoria. 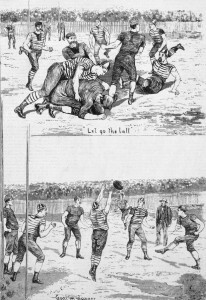 More footy history can be found online via the Football record and for a complete overview of our extensive holdings, see our Australian football page. When will the other 3 volumes be available? Hi Brian, we are not certain when the next 3 volumes will be published. I have contacted the author asking for information. When we hear something we will let you know. Tim Hogan, Australian History and Literature Librarian, State Library of Victoria.